The map above is represented by the cities and counties of Staunton, Augusta County, and Waynesboro. 250 Connector, Westbound, Monday – Friday: 7:30 a.m. – 9:30 p.m.
250 Connector, Eastbound, Monday – Friday: 7:30 a.m. – 9:30 p.m.
250 Connector, Westbound, Saturday: 8:30 a.m. – 7:30 p.m.
250 Connector, Eastbound, Saturday: 8:30 a.m. – 7:30 p.m.
250 Connector, Westbound, Monday-Friday: 7:30 a.m. – 9:30 p.m.
250 Connector, Eastbound, Monday-Friday: 7:30 a.m. – 9:30 p.m.
Staunton Hub connects with the Downtown Trolley, the West and North Loops, the Saturday Night Trolley, and the BRCC South Shuttle when they run at the same time. Walmart Waynesboro Hub connects with the Waynesboro Circulator and the Stuarts Draft Link when they run at the same time. 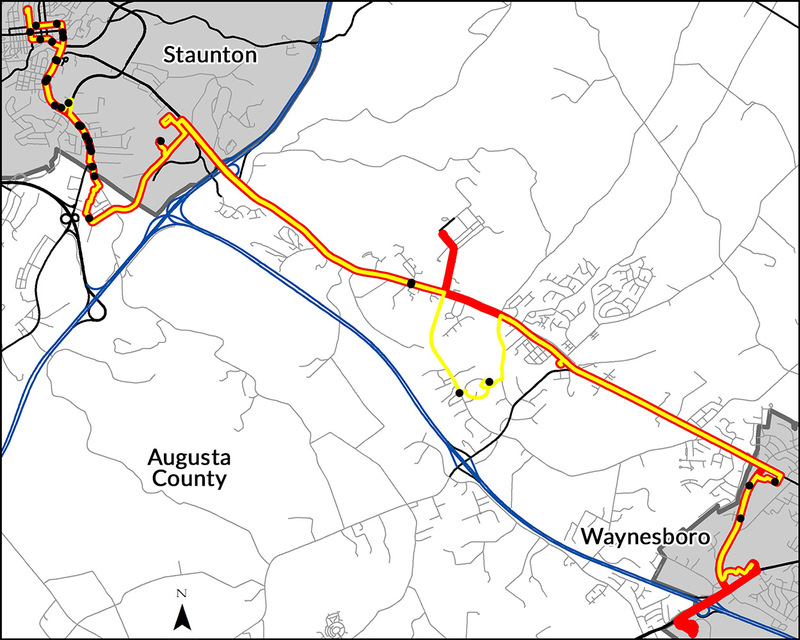 Reliable Transportation Connects Staunton To Waynesboro. Our 250 Connector provides bus transportation Monday through Saturday from Staunton to Waynesboro. With full service Monday through Friday and reduced service on Saturday, our consistent schedule gives you dependable transportation to your destination. Convenient drop-off and pick-up locations provide multiple options and time frames to catch the bus and get where you need to be on time. Stops include, but are not limited to: Walmart (both Staunton & Waynesboro), Augusta Health, WWRC, Augusta County Library, Valley View, and Waynesboro Town Center. Check out the full schedule! Get Comfortable On Our Buses. We strive for clean buses and a safe ride for all our passengers. Get comfortable in seats with ample room, seatbelts available for your safety, and grab bars strategically located to help you safely move around the bus. New to riding the bus? Our safety and rider tips help you have a smooth experience. Experienced Drivers Are Happy To Help. Our drivers help you get where you need to be. We encourage our passengers to ask questions about the route, policies, schedule, and other ways we can provide great service. Drivers are trained to assist with mobility devices, route transfers, and general knowledge of the transit system and local area. Dependable, friendly service is how BRITE drivers serve our community every day.